This guide will cover the basic options involved in configuring WorkSpace Portal. You will also learn how to set up staff notifications, enable or disable client access to features, link your merchant services, and customize the appearance of your portal. Use of the Office Tools WorkSpace Portal (Client Portal) requires Office Tools WorkSpace 2015.3xx or newer, a local email client (Outlook), and a modern internet browser: Internet Explorer 9.0+, Google Chrome 16.0+, Mozilla Firefox 5.0+, or Apple Safari 5.0+. Java and Java Script must be enabled and 256 bit encrypted browser settings with SSL 2.0 or 3.0 are required. Local firewalls must allow for use of SSL (https) communication. When you have purchased WorkSpace Portal, a welcome email will be sent to the email address on your Office Tools store account. This will be your Portal Admin user account. The welcome email will give you your username, which will be your email address, and a temporary password. Next, you will enter this email address and password in WorkSpace by going to Setup > Staff > Information underneath the Portal button. Select your Portal Admin from the list on the left and click the Portal button. You may now enter the Portal Admin credentials which you set up on the portal. Click the “Enabled” check box, then enter your email and password. After this, the first order of business is to add the rest of your staff as portal users. To add them, log in to WorkSpace as the Portal Admin. 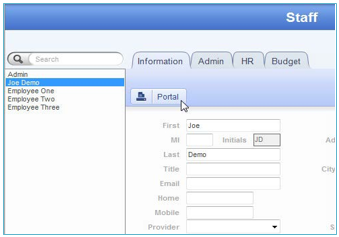 Then, use the same Portal button underneath the Information tab to assign portal credentials. 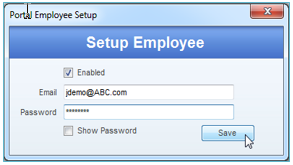 Because you are adding staff to the portal for the first time, you are also creating their portal login and password. Any subsequent password changes will first need to be made on the portal and then entered in WorkSpace. To begin the configuration of your portal page itself, log in to your portal at www.officetoolsportal.com. 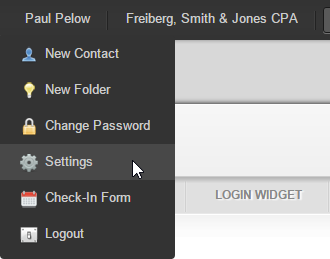 Then, hover over your staff name at the top of the page and select Settings from the menu below. To configure your notifications, select the Notifications section. Send email notification when client deletes a file – This will notify the staff which the client sent the file to. If a staff member was not selected, the main contact for the company will be notified instead. Selectable Staff for New File Uploads – Staff which a client can select to send a file to – The selected staff will receive an email notification. Client Information Updated – Notifies selected staff when a client has finished updating their information – The updated information will be available for them to review and approve. Client Questionnaire Completed – Notifies selected staff when a client has completed their questionnaire – A link to the questionnaire will be emailed to these staff members. Finally, configure your portal’s appearance and available features by clicking on the Customize tab. Logo – Upload your firm’s logo as either a JPG, PNG, or GIF with a maximum size of 330 pixels wide by 100 pixels high. Allow clients to delete files they uploaded – This will only allow clients to delete their files if they were the ones who uploaded them. Document Folders – This option will store documents in the same folder structure as your WorkSpace Document Management. Your clients will also be able to upload files to these folders. Turning this option off will disable folders on the portal and remove the Folders tab. Invoices & Payments – This option will allow you to upload invoices from WorkSpace. If you have entered billing credentials, your clients will also be able to pay for their invoice on the portal. Turning it off will remove the Invoices tab. Time Tab – This option will allow your staff to record their time on the portal. Turning it off will remove the Time tab. Schedule Tab – This option will allow your clients to request appointments with your firm. Turning it off will remove the Schedule tab. API Key – This key should already be entered in your portal integration settings in WorkSpace. 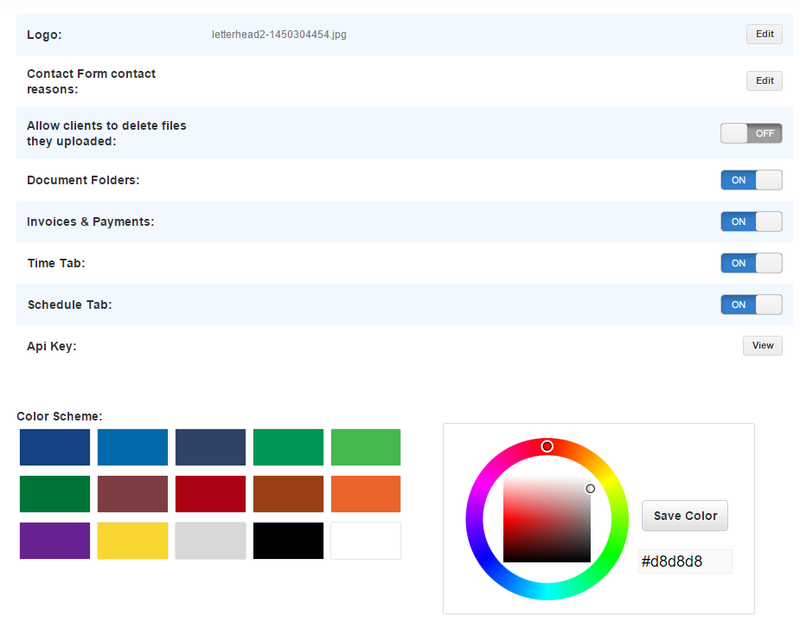 Color Scheme – Select the background color you want for your portal page. If you would like to have a login field for the portal available on your website, copy the code from the Login Widget tab and send it to your website developer. Can I send more than one document at a time on the Portal? Why is WorkSpace crashing when downloading a document form the Portal? How can I integrate the Portal with my website? Can I run a report to see all the email addresses currently synced to the Portal? Can I run a report to see how many clients are synced to the Portal? Is there a way to copy the notes from a document that my client uploaded? Is there a way to see how large the files are that are uploaded to the Portal? Why can’t I download a file from the Portal into WorkSpace? Why is the Portal button grayed out within WorkSpace? Can I use Outlook to edit the email reminders that get generated form the Portal? Why are my staff receiving the message “Unable to validate client portal subscription” when trying to upload a file to the portal?